With The Messenger being one of, if not my top game of 2018, the announcement of the free Picnic Panic expansion had me bubbling with excitement to see that one of my favorite games would be getting even more content. Knowing that a certified masterpiece was about to drop an additional adventure for me, I was ready to embark on another ninja quest filled with precise platforming, laugh out loud dialogue, and memorable original music. Though, what I wasn’t expecting was to get my hands on it early at PAX East 2019. But our friends over at Sabotage Studio in Quebec City have been hard at work on a new adventure for our scroll carrying hero, and apparently thinking of a way to make a The Messenger, a game I’ve given a 10/10, even better. The expansion to the core game will feature its own story that will take you through a new island complete with new bosses, tropical locales to traverse, and even some surfing. In this new quest, you’ll find yourself on Voodkin Island investigating what the Demon General Barma’ Thazel has done to the vacationing Phobekins. The demo starts you off by returning to the village where your initial journey began, where you’ll run into an old, tall friend Ruxxtin. From there you begin your voyage to Voodkin Island by surfing of course. The extent of the demo is this surfing session which has you hanging ten through multiple sections separated by checkpoints that ultimately culminates in fighting a giant octopus. The surfing is reminiscent of the sewer level in Teenage Mutant Ninja Turtles II: The Arcade Game, or similarly the Battletoads speed bike level but not as unforgiving or as difficult. Though, don’t be fooled, The Messenger‘s gameplay isn’t a walk in the park either but rather strikes a cohesive balance of difficulty that rewards skilled players and those who are willing to practice their ninjutsu techniques. It also gave me vibes of a similar level from Shinobi III, but that’s what one of The Messenger‘s strengths always has been is that it fills you with memories of multiple other retro games you may have a connection to, but doesn’t feel like it’s simply pulling at your nostalgia because Sabotage Studio always delivers with stellar visuals, chip-tune bangers, and top tier gameplay. Picnic Panic’s surfing has you maneuvering up and down three lanes filled with hazards, ramps, and barrels full of life replenishing green vials. With the ability to shift up and down the lanes as you wish, you can also jump, and dash. Dashing allows you to break through certain hazards to keep the speed and momentum going, while racking up points and multipliers. Successfully dashing through certain objects will also allow you to jump further enabling you to clear rows of rocks without taking damage. After successfully wading through these perfidious waters, your tubular trek will reach its crescendo when you encounter the giant octopus boss. The fight with this malicious mollusk requires patience and quick reactions to dodging his attacks and reflecting his ink back at him. The fight is difficult and had taken my life more than I care to reveal, but after steadying my focus and learning his attack patterns, I was able to vanquish my aquatic foe. Upon defeating this eight legged sea beast, the demo sadly comes to an end. Though, I was excited to see more tropes from retro games being given The Messenger treatment and modernized through the lens of 8 and 16-bit glory. Not that more platforming alone would have been a let down, but injecting some gameplay mechanics that are unique to Picnic Panic and not found within the core game is just one of the reasons why I appreciate the level of passion that goes into the level design of The Messenger. 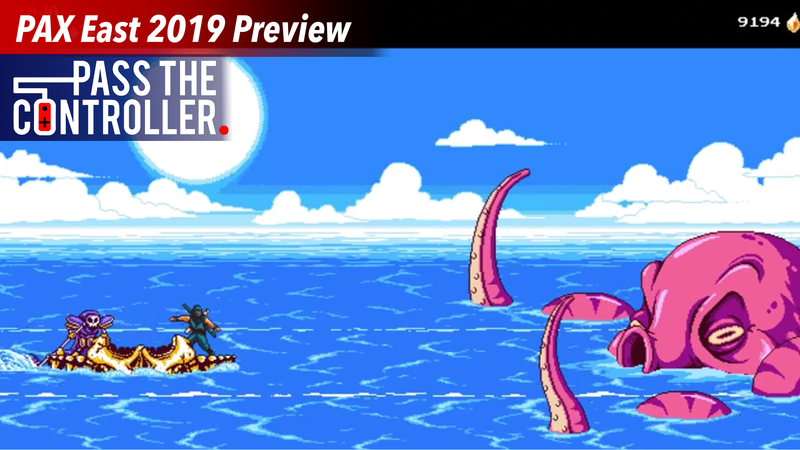 After chatting with creative director Thierry Boulanger about the rest of Picnic Panic and the promise of more genre defining platforming, more world building, and hilarious exchanges with the shopkeeper, The Messenger Picnic Panic was not only one of my favorite games I had the chance to play at PAX East 2019, but easily one of my most anticipated releases of 2019. Keep a lookout for this free expansion to drop sometime this year on Nintendo Switch, PlayStation 4, and Steam– but if you haven’t already picked up this masterpiece, you can read my full thoughts on the base game and why it is one of my favorite games of all time. For all things The Messenger and indie game related be sure to keep it locked to Pass The Controller– and for a deeper dive on all things gaming and nerd culture be sure to check out the Pass The Controller Podcast with new episodes weekly.